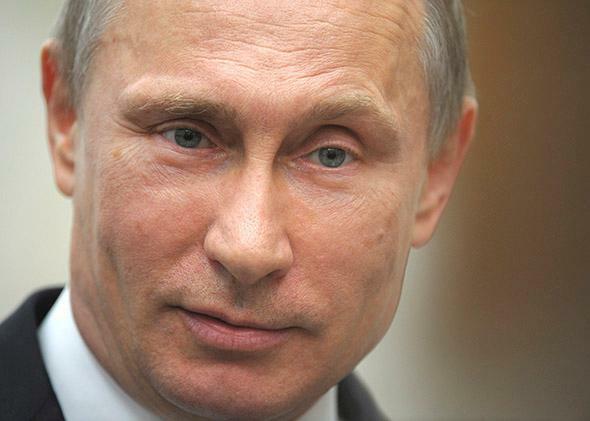 Vladimir Putin’s strategy in Ukraine: The Kremlin leader condemns and copies. The Russian leader follows a consistent strategy. First he condemns. Then he copies. DONETSK, Ukraine—To get into the headquarters of the Donetsk People’s Republic, the world’s newest self-proclaimed country, you have to pass two barricades laced with razor wire made up of tires, paving stones, and a couple of truck fenders. Everywhere homemade signs are hanging that say “Ukraine against American-Fascist Aggression” or “No to USA-EU.” A line of flags above the entrance flies the colors of Russia, the Russian airborne troops, and the DPR—a black-blue-red tricolor with a superimposed Russian double-headed eagle. Inside the 11-story regional administration building, seized by pro-Russian separatists on April 7, there is a burst of activity. Young men in camouflage, some wearing masks and carrying clubs, rush up and down the stairs as they carry out orders. In offices once occupied by civil servants, middle-aged men in fatigues huddle to plan the DPR’s glorious future. It’s no coincidence that the tires, placards, flags, masks, and fatigues bear an uncanny resemblance to the Maidan protest in Kiev, because even if the message of the Donetsk revolt is radically different, its trappings are an imitation of the people’s uprising that chased out the government of Viktor Yanukovych in February. For Vladimir Putin, mimicking his opponents is a key element to keeping power. At home the Russian president oversees a democracy with sham elections and a loyal parliamentary opposition made up of stuffed shirts. His foreign policy can be best described as “condemn and copy.” Since 2007, when he assailed U.S. hegemony in a Munich speech, Putin has been raging against the West—and then committing his version of the sins he’s just condemned. Regime change in Iraq gave Putin the green light to march into Georgia and make President Mikheil Saakashvili fear for his life; the NATO intervention in Kosovo and its eventual recognition as an independent country served as a justification for Russia’s annexation of Crimea in March; even the Eurasian Union, which Putin has been trying to force Ukraine to join, is a fake alternative to the European Union, which he envies and disdains. Now the Maidan protest, characterized by the Kremlin as a Western-sponsored armed coup, is being crudely imitated in towns across the Donetsk region. “If the guys on the Maidan could revolt, why can’t we?” has been the pro-Russian supporters’ motto, which ignores that the Kiev protest began as a grassroots, peaceful demonstration that grew over months and only became violent as a result of escalating police brutality. The peaceful phase of the Donetsk rebellion barely lasted a month before masked gunmen seized the town of Slovyansk without any provocation from the provisional government in Kiev. Only after the heavily armed fighters dug themselves in did the authorities launch a halfhearted, unsuccessful “anti-terrorist operation,” which resumed Friday morning. Russia supporters who take to the streets in the Donetsk region are hard-pressed to articulate their grievances. Most often people mention a law downgrading the status of the Russian language that the interim government tried to pass, but that bill was immediately vetoed by acting President Oleksandr Turchynov. Sometimes they complain that Kiev is using “tanks and planes” against them, yet the army rolled in only once the separatists took up arms. If the provisional government can be accused of anything, it’s that it neglected to reassure the citizens of the Donetsk region—Yanukovych’s political base—of their place in the new political order. The confusion is understandable given that there is no repression of Russians or their language to begin with. The often-used expressions of “ethnic Russians” or “Russian-speaking minority” create the impression that Russians and Ukrainians live in separate communities, when in fact they are completely intermingled and largely proficient in the other language. Kiev is still a Russophone city, despite its resistance to Putin. Since independence in 1991, older people in the Russian-speaking east have had trouble with the switch to Ukrainian as the language of bureaucracy; for the new generation, it’s no big deal. Even Yanukovych learned to address the nation in Ukrainian. The difference is roughly equivalent to that between Spanish and Portuguese. The illusion of a conflict is crucial for Putin’s plan to polarize Ukraine and prevent it from achieving the political stability needed to ward off economic collapse. If a few more pro-Russian regions break off as separatist republics, so much the better. Although the violence in the Donetsk region is very localized, images of icon-carrying villagers blocking Ukrainian troops in armored personnel carriers serve the narrative of a beleaguered Russian population under assault. Kremlin-controlled Russian TV presents a parallel reality where the United States is doing its best to split Ukraine; the Kiev government broke the Geneva agreement to defuse the crisis; and foreign mercenaries are backing up Ukrainian forces in Slovyansk. Never mind that the supposed people’s uprising in Donetsk is a caricature of the Maidan, which was an explosion of citizens’ anger. For a Soviet man and former KGB agent like Putin, the concept of civic activism—ordinary people acting without instructions or payment—is incomprehensible. Putin got his first big shock after Ukraine’s Orange Revolution in 2004, when demonstrators incensed by mass voter fraud brought about the annulment of presidential elections won by the Kremlin’s favorite, Yanukovych. Convinced that Western-financed student activists were behind the Orange Revolution, the Kremlin founded its own youth group, Nashi (“Ours”), to thwart any anti-government rivals. When tens of thousands of Muscovites took to the streets to demonstrate against rigged parliamentary elections in December 2011, Putin was at a loss. He blamed U.S. Secretary of State Hillary Clinton. Like the Moscow rallies two years ago, this winter’s Maidan protest was supported by the urban middle class and young people who came of age after the fall of communism. Together with backers from western Ukraine—which became part of the Soviet Union only after World War II—the demonstrators in Kiev made up a broad coalition not just against Yanukovych’s Moscow-sanctioned kleptocracy, but the country’s Soviet legacy. It’s no wonder that the toppling of Kiev’s Lenin monument in December was so symbolic. In eastern Ukraine, where ubiquitous Lenin statues are seen as a sign of Russian identity, feelings toward the Soviet past are more ambivalent. The industrial complexes and slag heaps that dot the Donetsk region have given rise to a gritty, working-class ethos. Locals looked down at the “good-for-nothings” who protested on the Maidan, as civic activism has never been writ large here. All the more surprising, then, were the pro-Russia demonstrations that began in Donetsk and other eastern cities in March. The Kiev government accused Russia of sending in busloads of provocateurs. The rallies attracted a mix of “angry babushkas,” aggressive, unkempt young men, and middle-aged conspiracy theorists—in other words, the losers of Ukraine’s transition to capitalism. Everybody assumed that they were being paid by Yanukovych’s henchmen, just as the thugs, the so-called titushki, who attacked the Maidan protesters had been. The danger today is that Putin’s fake separatist movement could take on a life of its own. The alarming footage on Russian TV of “Kiev’s punitive action against its own people” may force people in eastern Ukraine, who never even considered secession, to take sides. The Kremlin’s main goal is to rush through a referendum on independence on May 11 and undermine Ukrainian presidential elections scheduled two weeks later. If there’s bloodshed among the separatists before the referendum, Putin has reserved his “right” to intervene militarily in Ukraine. And if some kind of vote does take place, the Kremlin will be able to use it as the legal basis to send in “peacekeepers.” In a matter of days, it may not even matter if the separatists were real or not.